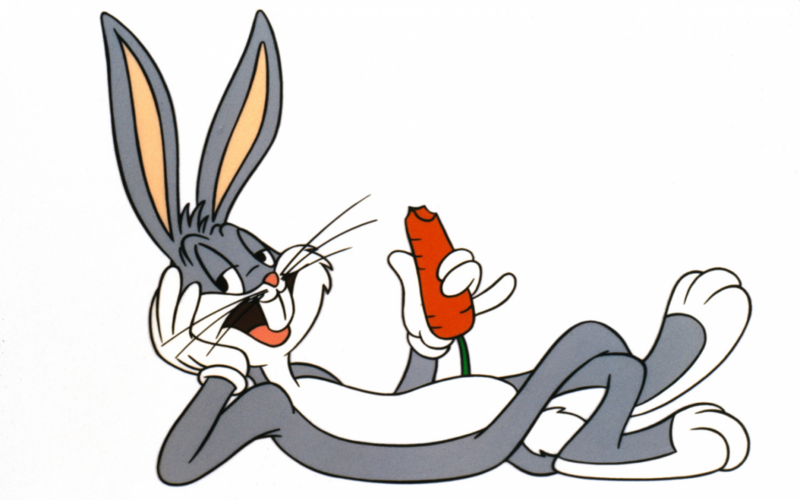 Pet CPI Update – Eh, What’s up Doc?…or down? The U.S. Bureau of Labor and Statistics released their June CPI numbers while most of us were off at SuperZoo. In my recent posts we have seen that changes in the CPI can affect consumer behavior when they are outside “expectations”. Then I’ll look in my crystal ball (and at history) and take a shot at predicting the annual change for 2014. Veterinary Services – Prices UP 1.53% since December; UP 3.02% over the 2013 average number. Veterinary prices go up every month like clockwork. The USBLS has measured the Vet Services for 198 consecutive months and prices have dropped in only 13 individual months over that whole period – almost all were less than 0.1%. Based upon history, I project that prices in this segment will be up 3.73% in 2014 over the 2013 annual number. In my initial projection from my blog on the period from 2009-2014, I used a CPI increase of 2.6% which was equal to the previous year. This year’s increase is now projecting to be 43.5% GREATER than expected. Even if this segment hits the projected retail number of $15.25B, over 60% will come as a result of price increases. Moreover, the adjusted growth (factoring out price increases) for the period from 2010 > 2014 will be a total of 2.0%…or 0.5% per year. Rising prices have basically stagnated the Veterinary Segment in terms of growth in the amount of services sold. It appears that this trend is continuing. 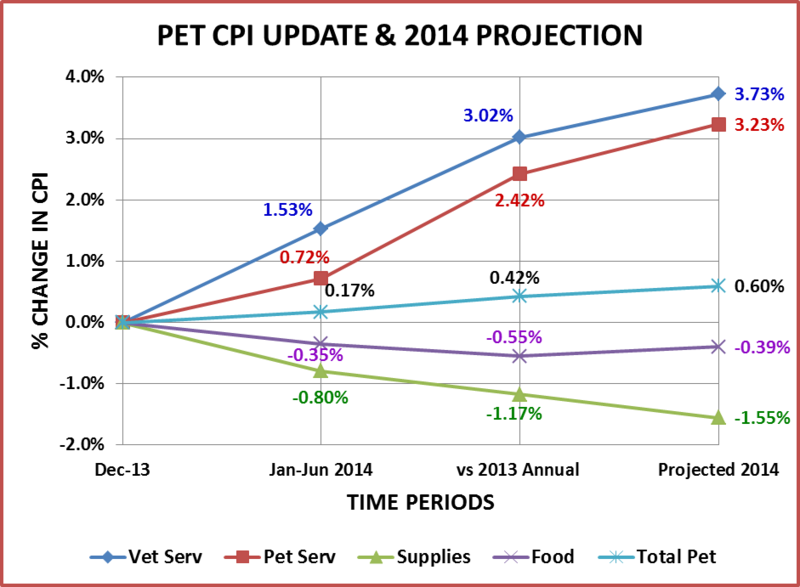 Non-Veterinary Pet Services – Prices UP 0.72% since December; UP 2.42% over the 2013 average number. Prices have also consistently gone up month after month in this segment, although not as fast as the Veterinary Segment. Based upon recent history, I project that prices in this Service segment will be up 3.23% in 2014 over the 2013 annual number. The previous year’s increase was 2.1% which was used to estimate the 2014 adjusted growth numbers. This increase is 53.8% GREATER than last year’s. Over 44% of this year’s growth will come from price increases…if they can hit the projected number. Unlike the other segments, Pet Services has not yet hit a “price wall” triggering reduced use by consumers. We’ll see how long that this continues. Pets and Pet Supplies – Prices DOWN -0.8% since December; DOWN -1.17% from the 2013 average number. Totally opposite from Services but equally concerning. This “deflation” began in 2010 and continues. Based upon recent history, I project that prices in this Supplies segment will FALL 1.55% in 2014 from the 2013 annual number. The previous year’s decrease was -2.1% so it is a little better than last year. However, I used a decrease of -0.8% in my previous estimates. I had hoped that the ongoing deflation would flatten out. It is slowing but not to the extent we would hope. Prices on Pets and Supplies have now dropped 5.5% since reaching their historical peak in 2009. That is an average annual deflation rate of 1.1%. As long as the consumer keeps increasing the amount of purchases the segment is fine. The concern is the increasing pressure on the manufacturers and the distribution channel due to deflating prices. Pet Food – Prices DOWN -0.35% since December; DOWN -0.55% from the 2013 average number. This is a bit of a surprise – to me, at least. After the unique price drop in 2010, this segment had been operating with a regular CPI increase of about 2.3%. Based upon the YTD numbers and history, I project that Food prices will FALL -0.39% in 2014 from the 2013 annual number. If Food hits the retail number of $22.62B the adjusted growth rate will be 5.3% – over twice the 2.5% adjusted growth that was expected with increasing prices. Pet Food prices have fallen in only 1 other year (2010) since the CPI was first measured in 1998. The prices in all segments rose strongly up through the recession in 2008-2009. The consumer reacted by buying less (amounts). A Drop in both Food and Supply prices in 2010 spurred a rebound in consumer activity. There is really no parallel in the current situation. The economy is not great but we are not in a recession. Prices in food have been growing at a manageable rate and consumer purchases were increasing at a regular rate. We’ll see if this is a short term anomaly or if Food prices have reached a price ceiling of some kind. 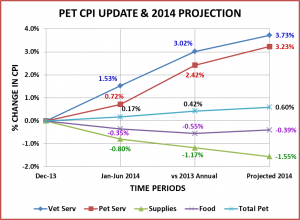 TOTAL PET – Prices UP 0.17% since December; UP 0.42% over the 2013 average number. All Services are up more than expected and both Food and Supplies are down, basically flattening the pricing in the total Pet Market. Based upon the performance in the individual segments, I project that prices in the Total Pet Industry will be up 0.6% in 2014 over the 2013 annual number. This is equal to the smallest increase of all time which occurred in 2010 and is only 35% of the average annual increase in the years since then. If the increases in the services weren’t greater than expected, we would be projecting a CPI increase of only 0.4% for the total industry – the lowest in history. Our overall increase of 0.6% is less than half that of these key indicators. The last time we had this low of an increase in the CPI the price drops in Food and Products helped boost us out of declining consumer activity in a recession. There is no recession now. Consumers were accepting moderate prices increases in Food and the segment was growing. The continued low prices for supplies was actually still generating consumer purchases in increased amounts. The pricing in both of the Service segments is still growing at a concerning rate – with seemingly no impact on the Pet Services segment but a stagnation in the quantity of Veterinary Services. Prices always go up for both of these segments in the second half so the increases will continue. The big concern now is the continuing deflation in the supplies segment and the sudden drop in food prices which is contrary to the activity in the overall CPI and the corresponding “human” food & beverage category. Many of you responded very positively regarding the info from my earlier CPI blogs. So when I got the USBLS info for June, I wanted to do a quick update. I assumed that it would be a simple checkpoint -“we’re halfway through”. It ended up being a bit more complicated. We are into the second half of the year with anticipated strong holiday and fall/winter lifts in many categories. The pricing situation in all Segments is not as positive as we expected. Everyone in the industry needs to focus on efficiently maximizing their efforts in this critical time of the year. Then, we will just have to wait and see how it plays out in terms of the impact on the consumer and whether we meet or beat our forecasted numbers.